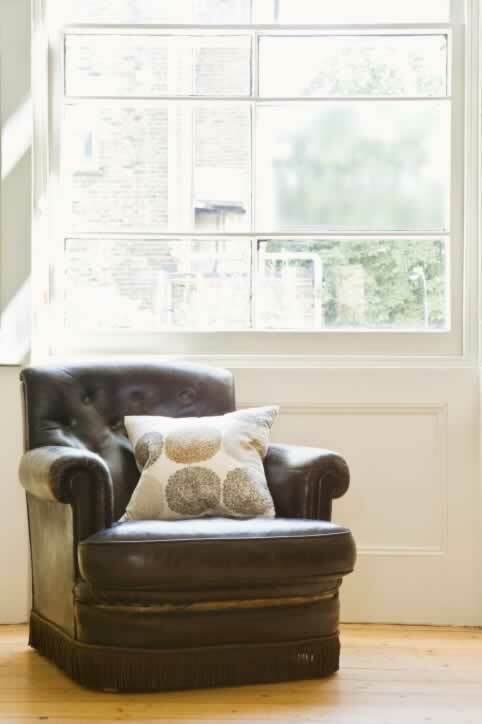 A leather chair, a paneled room, and a double-hung window make a timeless combination for comfortable living. Here the surprise elements are twofold: First, the double-hung windows are not only divided by wooden muntins (thin strips of wood,) but the pane sizes are dissimilar. Second, you'd expect dark stained wood panels rather than white next to the dark leather chair. Yet something as simple as a pillow with dark motifs on a white background ties everything together perfectly. The mottled circles of the fabric's motifs and the medium-toned knotted wood floors subtly add texture to the decor. All together the combination of unexpected windows pane sizes plus dark, light, and textural elements shake up that row of brick houses just the right amount--without raising eyebrows. The room also nicely balances to both masculine and feminine tastes, right down to the fringe on the leather chair.